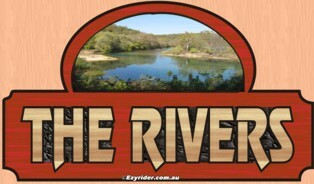 ﻿ Engraved Timber Signs, Designs, Graphics. Pictures & Information. Each design is personalised to your lettering requirements. The features section, just below, shows the particular features of the timber designs/signs. The finished product retains a grain surface finish, the lettering surface is left a natual timber grain colour. While the background is stained a mahogany colour. A number of coats of exterior high gloss finish gives the sign a rich and vibrant quality. Many other timber sign businesses have the 'lettering' engraved and than painted black. My designs are different in that the 'outside' of the letter is cut out, leaving the lettering raised and a timber colour, and the area in between is cut out to a rough finish and this area is painted black. The mahogany background face retains a grain pattern also. With all designs shown you are able to change the letters to your wording. You can also choose a letter style if you wish. View the lettering styles on a separate page. Letter styles. If you cannot choose a lettering style, Thatz-Kool, I will design something for you in a lettering style that I feel is appropriate to your wording. Artwork is prepared for you before work commences. The following designs and sizes show prices for those particular sizes, with your wording, and modified picture design that is suitable for outside use. The following prices are for labour content in producting your sign. Additional cost is the Cedar base. Please contact me for a current price.